If you have already gone through Drupal 8: #attached - Part 1, you’ve learned about the library, drupalSettings and http_header sub properties. If not, it’s highly recommended that you go back and learn about it first. Helps in creating <link> tags under HTML <head>. In our routing callback, we have attached a link tag to the page which describes the author of the page. Helps in creating tags like <meta>, <style>, etc, under the HTML <head>. In our routing callback, we have showcased the addition of a meta tag with the name ‘Cuisine’. Feed is a special case of the html_head_link which creates <link> tags. To demonstrate it, we have added a feed attachment in our render array which creates a link tag in the <head> section of the page. Helps in adding placeholders to the markup which help in rendering complex markups late in the render process. Firstly, In our render array we have created #markup which stores the placeholder called @foo. Secondly, the placeholders key in #attached defines what markup the placeholder @foo represents. In Drupal 7, we used different functions like drupal_add_css(), drupal_add_js(), drupal_add_html_head(), etc, for adding attachments. This was like remembering and calling different functions for different attachments. On the other hand, as we saw above, Drupal 8 just uses the #attached property to add attachments to the HTTP response. That’s beautiful, right? 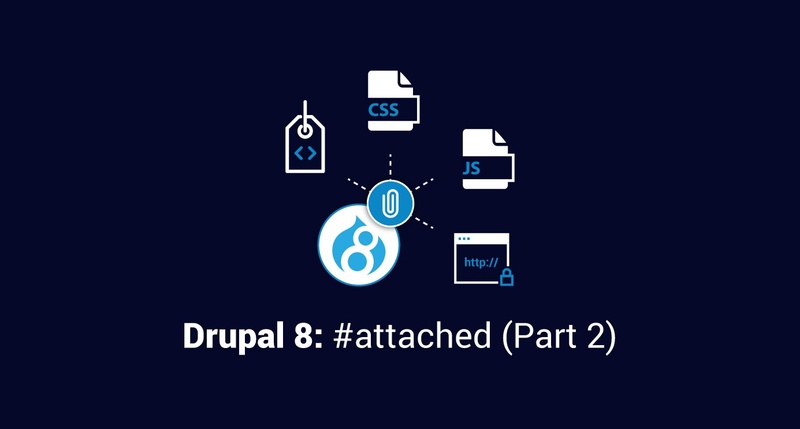 In case you missed it, here's Part 1 of the Drupal 8: #attached series.